Fey is a longtime fan of Burnett, calling her love for the pioneering comedian “just shy of creepy” when Burnett was awarded the Mark Twain Prize back in 2013. 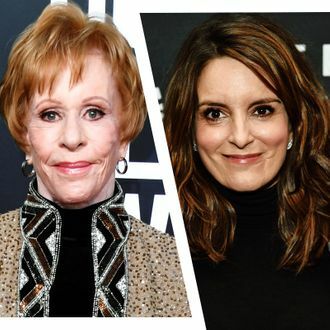 Alongside Amy Poehler, Fey also presented Burnett with the Lifetime Achievement Award at the SAG Awards in 2016, where they wrapped up their introduction by saying, “The point is, Carol is better than all of us. We’re gonna give her a prize for it.” So, yeah, Fey is definitely the right person for the gig.